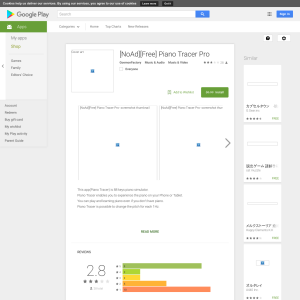 This app(Piano Tracer) is 88 keys piano simulator. Piano Tracer enables you to experience the piano on your Phone or Tablet. You can play and learning piano even if you don't have piano. Piano Tracer is possible to change the pitch for each 1Hz. What is Standard Piano Pitch or Concert Pitch and why do we need it? Standard Pitch is a universal frequency or note that all instruments are set to. Today’s standard pitch is A440 and this concert pitch enables musicians to play instruments together in harmony. However, the pitch standards had gradually risen from about A415 during the late 1700s and early 1800s to A435 during the late 1800s. Though A440 is generally the standard, some orchestras, particularly in Europe, use a higher pitch standard, such as A444.